NetHost offers shared hosting with SSD storage and LiteSpeed Web Servers. The plans are well-priced, but customer service is lacking. NetHost is a Vietnamese hosting provider with servers located in a Tier III data center. Currently, it has more than 6,000 customers using its services. The website is available in English and Vietnamese. NetHost uses a Tier III data center, which is located in Vietnam, as well as having servers collocated in a U.S. data center. Tier III means you can expect less than 1.6 hours of downtime per year, plus, there’s an industry average uptime record of 99.9%. The plans run on CloudLinux, which is excellent for isolating your data from your neighbors, with LiteSpeed ​​Web Server, LiteSpeed ​​WordPress Cache, and SSD storage in RAID configuration. Overall, these are excellent features to enhance the speed and performance of your website. There is the choice of cPanel or DirectAdmin control panels, which are both solid choices, support for PHP versions 5 through 7, daily backups, and 24/7 monitoring of the servers. If you’re a beginner, you’ll be pleased to see a premium offering of Softaculous with more than 430 programs supported. The plans are all well-priced, especially given you get SSD storage, a Tier III data center, and CloudLinux. Furthermore, the upper tier plans enjoy a free SSL certificate, domain name, and unlimited bandwidth, all at an affordable monthly price. You can purchase the plans in terms ranging from one month to one year, but you won’t get a discount if you purchase the latter upfront. Don’t let that put you off, the prices are low, so it’s to be expected. Customer service is 24/7 by phone, live chat (Facebook messenger), and tickets. There’s also a decent knowledge base if you’d like to solve your issues without the need to contact support. 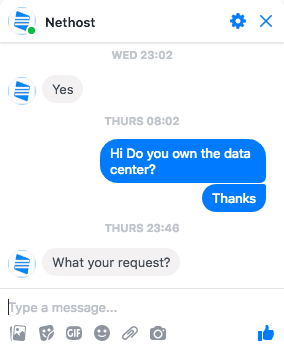 My main reservation is a slow reply when I contacted the team via live chat. Granted, it was late, around 10:00 PM on a Wednesday night, but I didn’t get a reply back for over one day. Furthermore, when I did get a reply, it was very brief and didn’t answer my question at all. If you’re looking to scale your online presence, as well as shared hosting with SSD, NetHost also sells Linux or Windows VPS and dedicated servers. The plans are well-priced with generous resource allocations, I’m just not sure if support really is available around the clock. Buy affordable hosting at Nethost!